Santo Domingo, November 13, 2013. 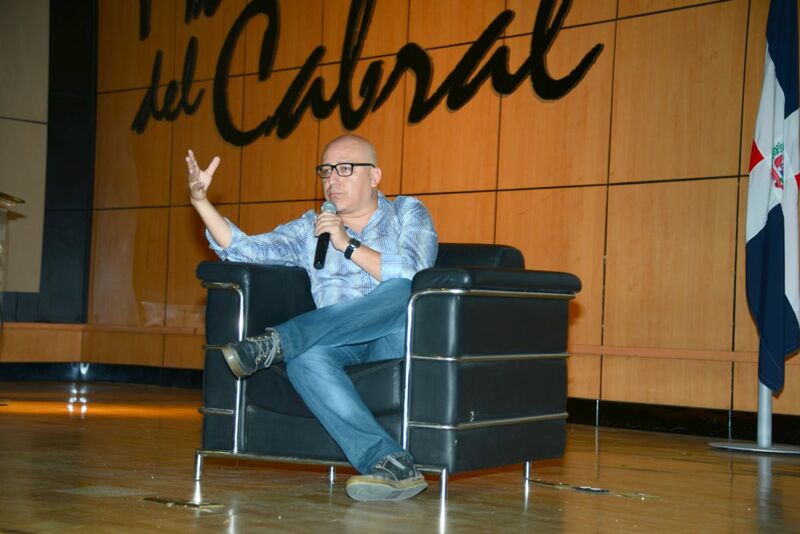 – “A good subject does not make a good movie,” said Mexican film director Rafa Lara during the panel on “Screenplay writing and directing” held in the Manuel del Cabral auditorium of the Autonomous University of Santo Domingo. “The screenplay is a clear and specific document for telling the story, it must have concrete ideas in clear and simple language,” said Lara after giving some guidelines for creating a well-structured screenplay. Rafa Lara is a Mexican director with over fifteen years of experience in different countries, with studies in communication science, political science, economics, psychology, film directing, playwriting, scripting, graphic design and music. His productions include a number of documentaries about Latin American for the Discovery Channel, the film short Nadie Escucha (2002), La Milagrosa (2008), Labios Rojos (2011), El quinto mandamiento (2012) and Cinco de mayo: La battalla in 2013. On the panel were students from several different schools, apprentices and movie fans. These participants had a chance to have an interactive encounter with director Lara and address many topics such as: the screenplay, guidelines on being a good film director, and how to achieve success in the industry. To the delight of those present, Lara showed trailers from many of his films including: La Milagrosa, Labios Rojos, El quinto mandamiento, and El cinco de mayo, la batalla. Moreover, Loyola Polytechnic showed one of the film shorts that was being screened at its own Film Festival. This panel is one of a series of activities that are being presented during the Seventh Dominican Global Film Festival, an initiative of the Global Foundation for Democracy and Development (FUNGLODE).